With their signature shaking tails and venomous fangs, rattlesnakes are as recognizable as they are lethal. These creatures are superior hunters that track and kill their prey under cover of darkness, when their natural senses give them an advantage. While there are minor variations among different types of rattlesnakes, they all have the same general modus operandi when it comes to striking down their foes. Rattlesnakes tend to hunt when the sun does down, finding their prey around dusk and at night. This is because they have special pits on the sides of their heads that are equipped with heat-detecting capabilities. In the dark they work almost like night vision goggles, allowing the snake to detect prey simply from the body heat it emits -- even when he and his prey can't see each other with the naked eye. Following the prey's heat signature, a rattlesnake stalks his prey. In addition to "seeing" the prey, a rattlesnake's heat detection can actually "see" the trail of heat left behind by a moving animal. This enables him to follow prey throughout the environment, like a bloodhound follows a scent. The snake uses his tongue as well, which flicks in and out of his mouth to detect his prey's scent. This is useful both for initially tracking prey and for following the trail of a wounded adversary attempting to escape. Confronted with prey, a rattlesnake actually attacks using two massive, hidden fangs. These fangs are actually hinged, so when he closes his mouth, they fold up. When he opens his mouth, they deploy at a 45-degree angle, allowing him to snap and strike at his opponent with a powerful bite. Generally at this point the rattlesnake injects his victim with powerful, toxic venom that shoots through the hollow fangs, like medication through a needle. The snake controls how much venom he uses, and in fact, he'll skip the venom altogether about 1 out of 5 times -- it takes a little work to replenish his stores. 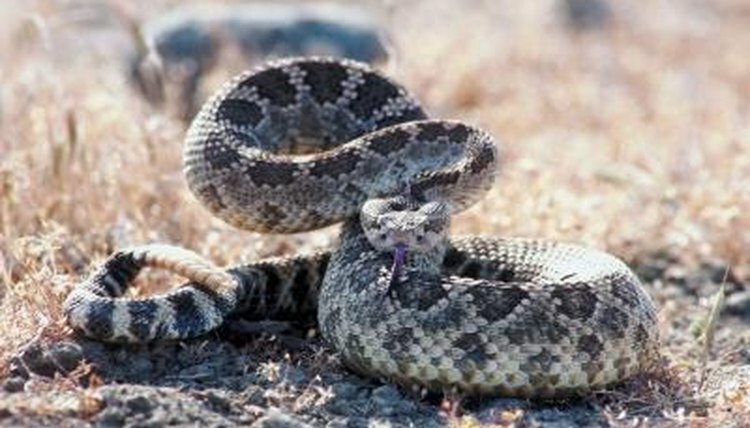 Rattlesnakes developed venom primarily as a hunting and killing mechanism, not for self-defense. This is one area in which different types of rattlesnakes deviate from one another, as the chemical makeup of venom varies. In some snakes, the venom itself is fatal to an injected animal. In other cases, venom incapacitates the snake's victim in one of several ways, like inducing respiratory paralysis. Whether or not the venom kills the prey, the animal is incapacitated while the snake swallows it whole. The digestion process is such that a rattlesnake may only need to feed once every two or three weeks.